Location: Disneyana Shop, Main Street, U.S.A.
Join us Sunday, June 8, 2008, as we celebrate the release of our newest mini attraction poster commemorating the Monorail Mark VII by Walt Disney Imagineer & Principal Concept Designer, Scot Drake. Scot has captured the sleek, elegant modern design of the new Monorail Mark VII as it travels high above the waters of Tomorrowland on its circumnavigation of the Disneyland® Resort. Scot will be on hand for a special appearance and signing from 9:00AM to 11:00AM at the Disneyana Shop on Main Street, U.S.A. 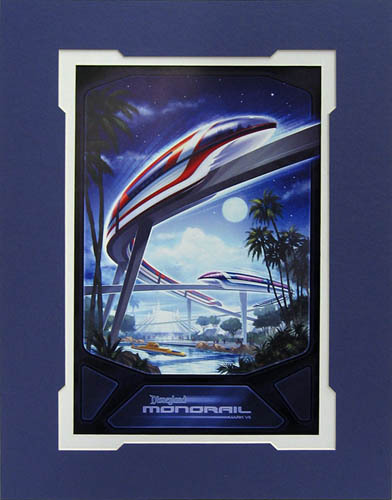 The Monorail Mark VII open edition mini attraction poster comes matted and will be available for $35, plus tax. Dimensions: 14″ x 18″. In addition, we will offer a framed set featuring two mini attraction posters – the 1959 Monorail Mark I and the 2008 Monorail Mark VII. See Image Below. This open edition framed set will be available for $195, plus tax. Artist will only sign his respective artwork purchased at the Disneyana Shop on the day of the event. Limit TWO (2) items signed per Guest. Artist appearances are subject to space and availability and are not guaranteed.